With the PinPoint Targeted Integration System you can get controlled, single-copy integration of your PinPoint Donor Vector at a pre-placed PinPoint attP site. The CAG-GFP-T2A-Luc PinPoint Positive Control Donor Vector (pPP-CAG-GFP-T2A-Luc-WPRE-pA-attB-Puro-pA; Cat.# PIN600A-1) inserts GFP and luciferase markers into the PinPoint attP site. The markers are co-expressed from the strong CAG promoter, with co-expression mediated by a T2A element. The vector also includes a promoterless puromycin marker to enable selection for the desired integrants—proper integration into a PinPoint attP site inserted using any of SBI’s PinPoint Placement Vectors (Cat.#s PIN300A-1, PIN400A-1, and PIN410A-1) results in a PGK promoter positioned to drive the puromycin marker—as well as a LoxP site to mediate removal of most of the unnecessary vector sequences, and both kanamycin and hygromycin markers for cloning and propagation. With the PinPoint Targeted Integration System, you can ensure that only a single copy of your transgene is inserted into the genome. Insertion of the PinPoint placement site (PinPoint attP) into the target genome using either the PhiC31 Integrase, which preferentially inserts into transcriptionally active sites of the genome, or the CRISPR/Cas9 System for insertion into a defined locus, such as the AAVS1 Safe Harbor Site. Integration of a PinPoint Vector into the pre-placed attP site. Integration is mediated by the PinPoint Integrase, which mediates a recombination event between the PinPoint attB site (located on the PinPoint Vector) and the PinPoint attP site (placed into the target genome in step 1). Because the PinPoint Integrase only recognizes your pre-placed PinPoint attP site, you get very stringent control of integration location. A third optional step involves removal of extra vector sequences using the Cre/Lox system, leaving behind only your expression cassette and a single LoxP site. 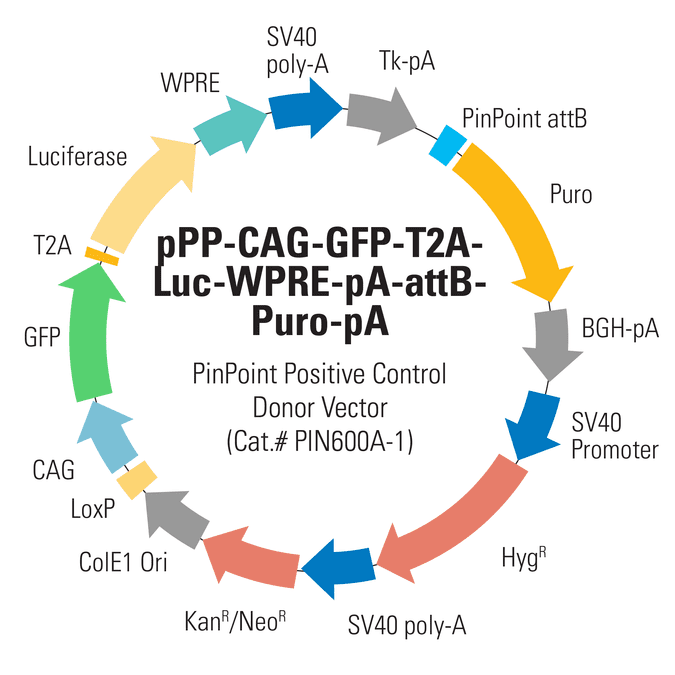 When you use any of SBI’s PinPoint Placement Vectors (Cat.#s PIN300A-1, PIN400A-1, and PIN410A-1) to insert the PinPoint attP site, the PGK promoter on the Placement Vector combines with the promoterless puromycin marker on the CAG-GFP-T2A-Luc PinPoint Positive Control Donor Vector to enable puromycin selection only if the PinPoint Donor Vector integrates at the correct site.